My neighbors are cool. Tonight I was out on my back deck shooting these mac daddies and they still don't think I'm weird. Allow me to rephrase: they still like me. Despite the fact that they couldn't see what I was doing, other than sitting around with a camera glued to my face. They knocked on their back door and waved, so I know they saw me. Maybe they knocked because they were hoping I needed taste-testers. I should probably take them over a second round of peanut butter pie. My neighborhood is also cool. And has a sweet bakery, Dolce (pun intended). 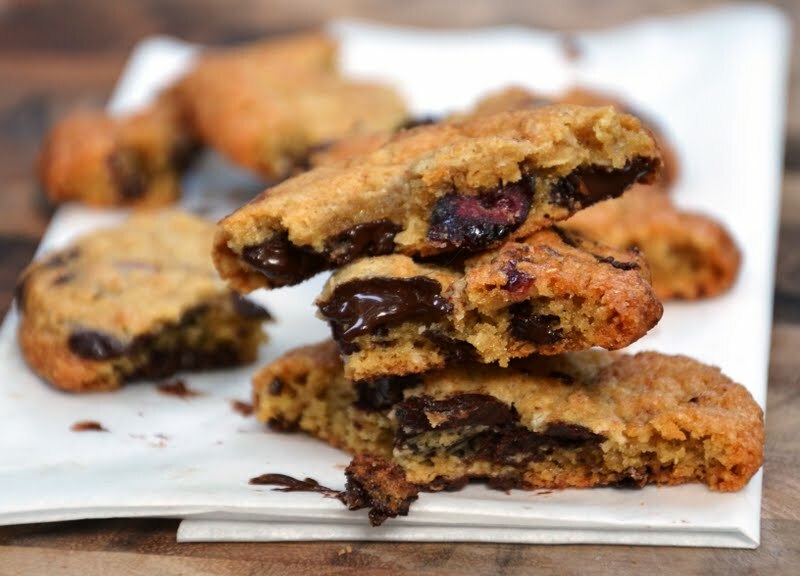 They make a mean oatmeal cranberry chocolate chip cookie. I love the added texture and flavor of the oatmeal, the tartness of the cranberries, and the richness of the bittersweet chocolate. So, naturally, I set out to recreate them. In a stand mixer with the paddle attachment, cream butter and sugars on medium-high for 2-3 minutes until fluffy and pale yellow in color. Scrape down the sides with a spatula. On medium-low speed, add eggs and vanilla to incorporate. Increase speed to medium-high and start a timer for 10 minutes. During this time the sugar will dissolve, and the mixture will turn pale yellow and double in size. When 10 minutes are up, turn mixer to low and add flour, baking powder, baking soda and salt until dough just comes together and dry ingredients disappear. Scrape down sides of the bowl with a spatula. Still on low, add oats and mix until just incorporated. Then add cranberries and chocolate chips, mixing until they are evenly distributed. Portion cookie dough onto a parchment lined sheet pan. For thicker cookies in the end, shape into cylinders, as opposed to balls. The cookies now need to be refrigerated to keep from spreading too much when baked. You can either flash freeze the dough balls, then place in a ziploc to keep in the freezer until needed, or wrap the pan and refrigerate for at least an hour or up to a few days before baking. Heat the oven to 400. Take the plastic off cookies and bake 9 to 11 minutes. At 9 minutes, the cookies should be browned on the edges and just beginning to brown towards the center. Leave the cookies in the oven for the additional minutes if cookies still seem pale. 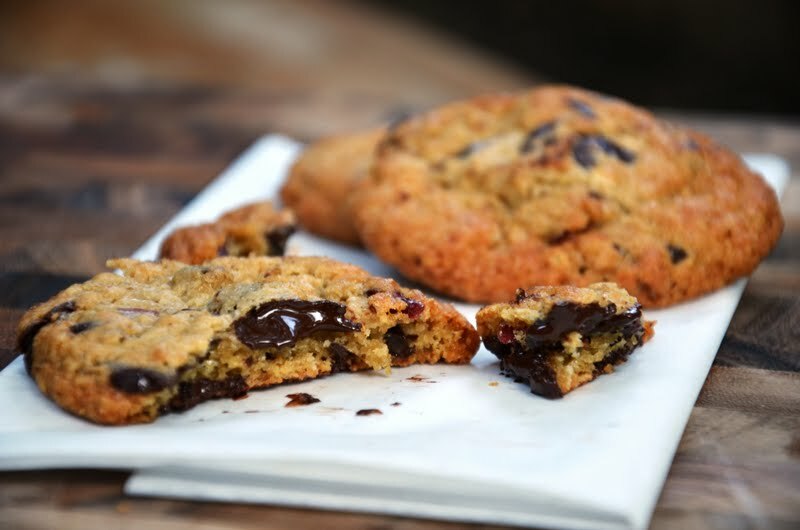 Cool cookies completely on the sheet pan before transferring to a plate or an airtight container. Looks yummy, Carly! If I was your neighbor, I wouldn't think you were weird either! These sound pretty perfect, I love any kind of oatmeal cookie! I just made these too recently, but used white chocolate chips. Both versions are great!